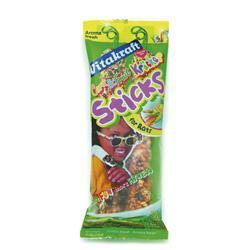 Vitakraft Corn & Fruit Kracker Sticks For Rats. Rat Corn & Fruit Sticks Give Your Pet Rat A Healthy, Crunchy, Tasty Treat They Will Enjoy. These Sticks Combine A Crunchy, Wholesome Taste Of Corn And Other Grains, With A Sweet, Chewy Taste And A Variety Of Fruits. Lots Of Vitamins And Minerals Too!